How on earth to choose just one Jane Austen novel? Austen, for some, is simply the supreme English novelist, on any list. Some will say: she is the greatest. Nominate all six, from Pride and Prejudice on. But the rules of our selection only allow one title per author: there has to be a choice. So, to represent her fiction here, I've chosen Emma for three particular reasons. First, it's my personal favourite, a mature and brilliant comedy of manners (and much more besides) completed towards the end of her life. Second, published by John Murray, Emmatakes us into a new literary landscape, the beginnings of a book world that lingers unto the 21st century. And third, most importantly of all, Austen's last novel has the sparkle of early books such as Pride and Prejudice, mixed with a sharper and deeper sensibility. There's no accounting for taste: I simply prefer it to the others. Emma was written in a white heat – according to the scholars – between 21 January 1814 and 29 March 1815 (the year of Waterloo), and it comes as the climax to a remarkable period of intense creativity. Pride and Prejudice (whose first draft, "First Impressions", was written in 1796-7) had been published in 1813, Mansfield Park in 1814. Austen's work was becoming something of a cult, and she was aware of her audience. Indeed, the Prince Regent was a fan (Emma is dedicated to him). Austen must have been conscious that she was no longer writing just for herself. She was at the peak of her powers, yet had less than two years to live. All this, I think, gives Emma an added depth as the final flowering of a great artist and her work. The novelist herself is highly conscious of her art. Emma, she wrote to a friend, is "a heroine whom no one but myself will much like". Perhaps. However, compared with her other heroines – Elizabeth Bennet, Fanny Price, Anne Elliot, and Catherine Morland – Emma is the most complex, subtle and complete. Yes, she is "handsome, clever and rich". But she's only 21 and will be sent on the familiar Austen cycle of wrong-headedness, remorse, repentance and ultimate self-realisation (with Mr Knightley) in a far deeper way than her predecessors. Emma represents mature Austen in another way, too. She has perfected the art of free indirect speech to convey the inner life of her heroine while retaining her control of the narrative as the omniscient author. Light and shade are expertly and satisfyingly in harmony, and the novel's deceptively simple plot is spun into so much teasing variety, through games, letters and riddles – the book is exceedingly playful – that the reader is never less than fully engaged, even charmed. Then there's Austen's mature delight in her milieu. She herself famously wrote that "three or four families in a country village is the very thing to work on", andEmma's Highbury exemplifies this credo. Here, fully in command of her genre, Austen revels in her characters and their foibles. Mr Woodhouse, Mr and Mrs Elton, poor Miss Bates, Jane Fairfax and her fiance, deceitful Frank Churchill and, of course, noble Mr Knightley – these are among the most vivid and universal characters in English fiction, as real to us as Pickwick or Jeeves. Emma herself is endlessly fascinating, a woman to whom the reader returns again and again for the seductive intimacy of her thoughts, a secret communion that's braided with the lesson that self-knowledge is a mystery, vanity the source of the worst pain, and the subconscious a treacherous and imperfect instrument in the management of the psyche. You can object that Emma is a lady and a snob, but she also makes a timeless appeal to the reader's better nature. Austen seems to have known that she was working on something special.Mansfield Park had been published by Thomas Egerton. This time, however, she wanted better terms and more literary prestige. There was only one address for that: 50 Albemarle Street, Mayfair. She approached John Murray, Byron's publisher, offering her new manuscript. Murray accepted at once and his edition appeared in December 1815, after a trouble-free editorial process in which her new publisher made a point of treating her with the greatest respect, though author and publisher never actually met. Emma occupies a special place in this list because it is supremely English – in character, landscape, sensibility and wit. It's provincial, opaque, sparkling and wonderfully optimistic while being at the same time tinged with intimations of sorrow and mortality. In the end, it answers Jane Austen's own high-spirited prescription for the novel, expressed inNorthanger Abbey: "in short, only some work in which the most thorough knowledge of human nature, the happiest delineation of its varieties, the liveliest effusions of wit and humour are conveyed to the world in the best chosen language". There was just one text prepared in Austen's lifetime, the John Murray edition, dated 1816, though it was actually published in three volumes in December 1815. No manuscript survives. Subsequent editions, notably by RW Chapman, have made silent corrections to typographical errors, but no substantial emendations. Emma has been continuously in print since its first publication: that's one definition of a classic. 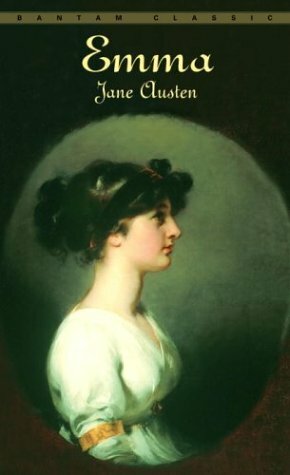 Other Austen Titles: Sense and Sensibility (1811); Pride and Prejudice (1813); Mansfield Park(1814); Northanger Abbey and Persuasion, published posthumously in 1817.
lihat pengarangnya Jane Austen jadi inget mata kuliah literature . Karyanya yang luar biasa , membuat namanya masih dikenang hingga sekarang.